In 1957 Noam Chomsky introduced Phrase Structure (PS) grammars, a form of generation systems denoted [∑, F], where ∑ is a set of initial symbols and F is a set of rewrite rules. Pierre Schaeffer introduced the TARTYP (Tableau Récapitulatif de la Typologie) in 1966 as part of his typology of sound objects. In Embracement for cello and electronics paper, I have used a compositional method that combines the TARTYP classification with generative grammars. My goal was to develop compositional tools that generate and re-compose unified musical structures in real time. A machine 'knows something', if this something can be computed, given the machine as an input. (“Proof of Knowledge,” in Wikipedia) The performance of the computer in Proof of Knowledge for flute, electronics and video is governed by a dynamic control system. This system is based on a schema and an algorithm of structural mapping between a mass-spring network and live electronics. The mapping is based on the pitch organization of the flute part. The synchronization between the flute and the electronics in this piece is a product of the cause-and-effect relations between the flute and the physical model. This synchronization is achieved by a time-base comparison between the live signal and the model’s parameters. Triggers for tenor saxophone and electronics is an interactive composition that combines pre-composed material with improvisation. In this composition, I have used the granular synthesis method to provoke an interaction between the saxophone and the computer. This method generates complex sounds from many microsounds, also known as grains. A typical granular synthesis system will receive three main modifiers: a carrier signal, a grain-triggering signal and a grain-shaping envelope. 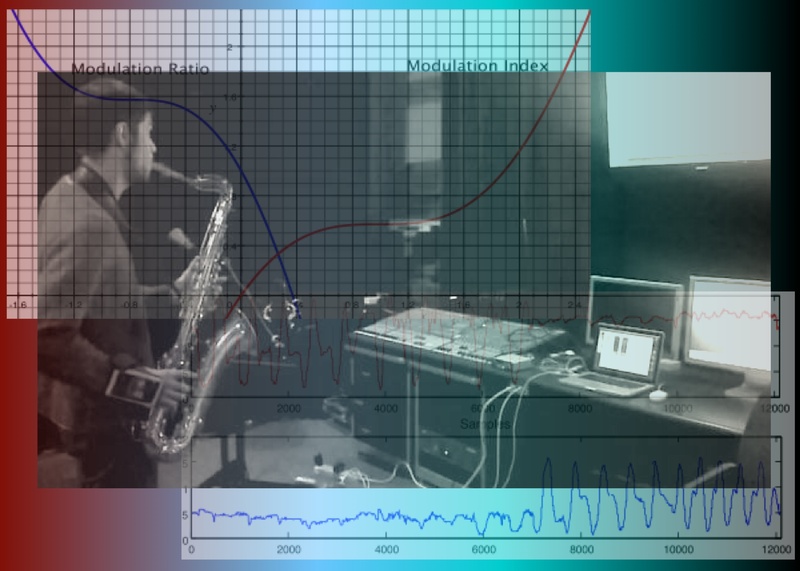 In Triggers, live saxophone sounds and computer-generated signals assume different roles in modifying the granular synthesis system. Live saxophone sounds, and likewise computer-generated signals, may serve as carrier signals or as grain-triggering signals in different sound events throughout the piece. The sounds, which are delivered to the listener, are always a consequence of an onstage reality, not an account for past occurrences. 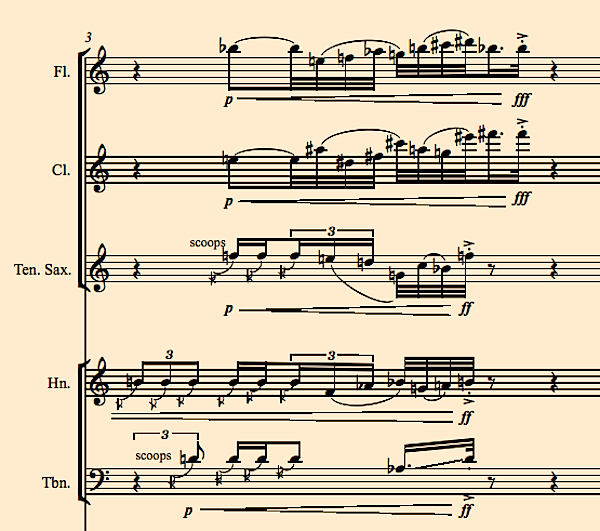 At the same time, causality transpires in this piece as the pre-composed material initiates improvisational responses by the saxophonist and the computer. Require Max/MSP 5 or a later version and the external objects: liveGranul~, SynGranul~ and rand_dist_list~. A mechanical system is said to oscillate in a normal mode when all of its particles move simultaneously with the same frequency. Hence, a normal mode is a coordinated motion of particles. The composition Normal Mode derives its frequencies of oscillation from two different musical worlds. The electronics of the piece were created through a process of digital sound synthesis with reference to the microtonal octave division of Turkish music. The ensemble material was conceived within a Western-influenced serial pitch organization. These two distinct forces never cancel each other. Instead they create much tension and motion and sometimes, philosophically speaking, also find a normal mode. Pierre Schaeffer’s theory of sound objects is a milestone in the historical development of electronic music. The TARTYP plays a central role in this theory. 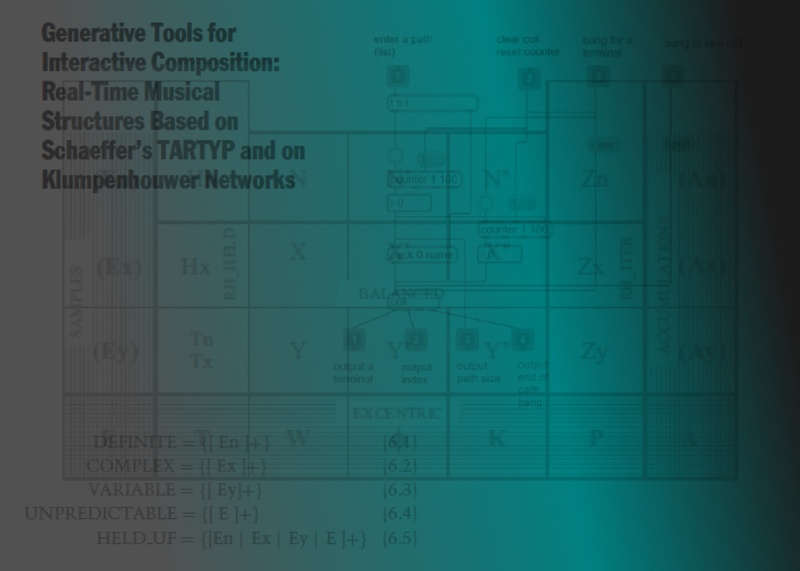 The TARTYP, however, is not widely accepted as a practical tool for musical analysis and composition, in part due to the large number of confusing and vague terms it introduces. 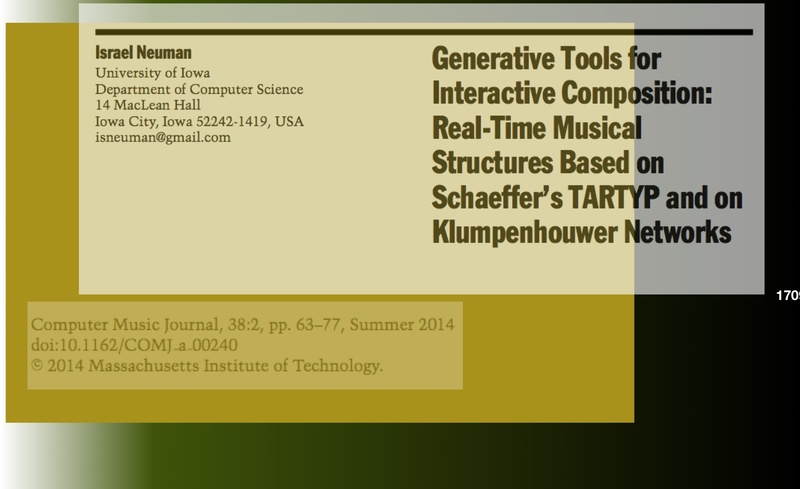 This paper suggests a focus on Schaeffer’s sound recordings that exemplifies the TARTYP as a source for aural learning of this taxonomy and an improvisational approach that explores the practical applications of the TARTYP to real-time composition and computer improvisation. 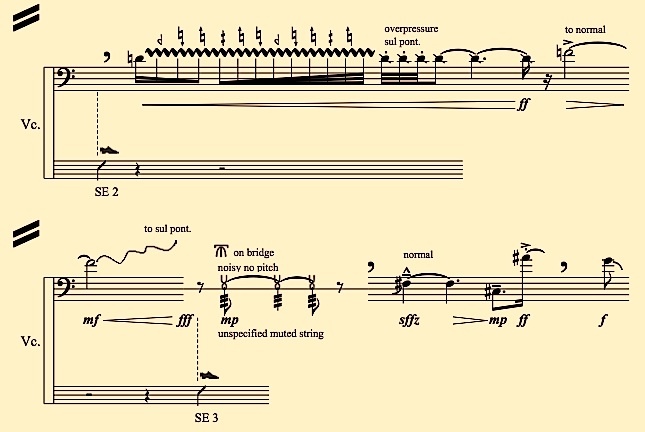 A software based on the TARTYP generative grammars and a performance system supporting this improvisational concept are presented along with specialized graphic notation of TARTYP sound objects set in animated scores. Finally the paper describes performance practices developed for SIG~, a Schaefferian improvisation group based in Iowa City. Motion is a time-based event situated in three-dimensional space. In the performance of most musical instruments, the musician associates physical motion with audible results. In some instruments, physical motion is used to change the timbre of the instrument. Digital techniques of analysis and re-synthesis have paved the way for the understanding of timbre as a distribution of energy among spectral frequencies in a three-dimensional space bounded by axes representing time, frequency and amplitude. 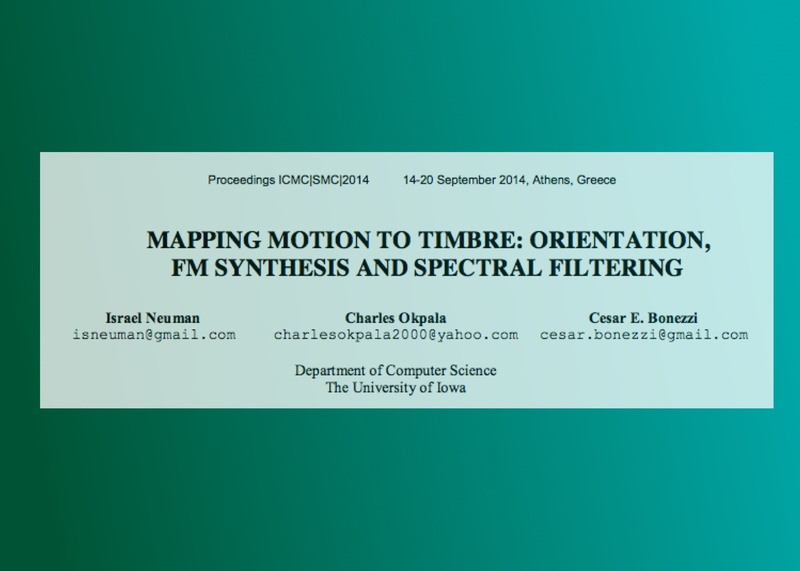 In this paper, we present a musical performance system that explores the correlation between motion and sound, more specifically, timbre. A mobile device and its motion sensors function as a control element in the performance system that creates new timbres in real time. Interactive computer music is comparable to improvisation because it includes elements of real-time composition performed by the computer. This process of real-time composition often incorporates stochastic techniques that remap a predetermined fundamental structure to a surface of sound processing. The hierarchical structure is used to pose restrictions on the stochastic processes, but, in most cases, the hierarchical structure in itself is not created in real time. 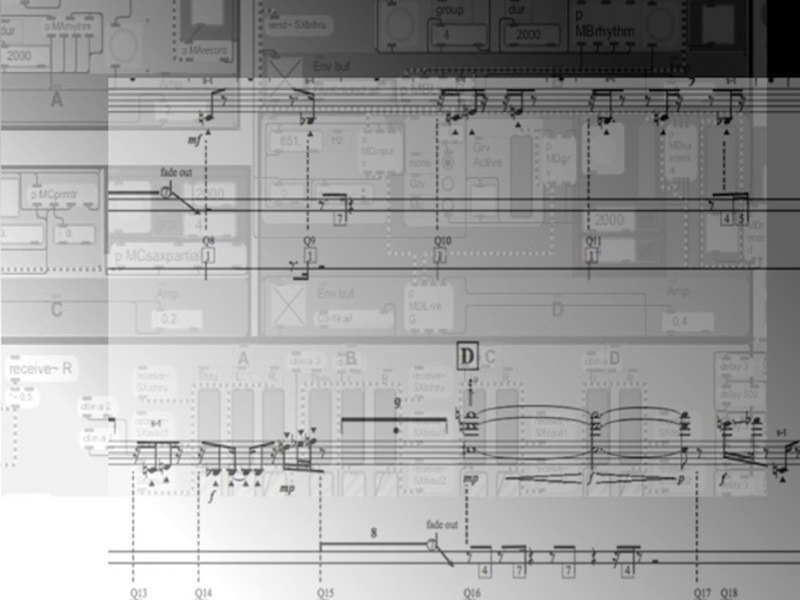 This article describes how existing musical analysis methods can be converted into generative compositional tools that allow composers to generate musical structures in real time. It proposes a compositional method based on generative grammars derived from Pierre Schaeffer’s TARTYP, and describes the development of a compositional tool for real-time generation of Klumpenhouwer networks. 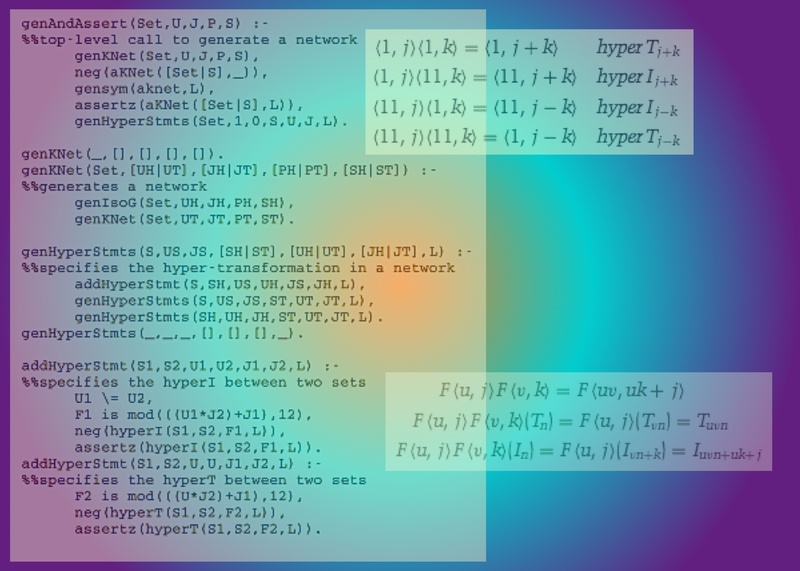 The approach is based on the intersection of musical ideas with fundamental concepts in computer science including generative grammars, predicate logic, concepts of structural representation, and various methods of categorization. Noam Chomsky’s Phrase Structure (PS) grammars and the [∑, F] form of rewrite rules are an efficient analytical tool for complex musical structures as well as a generative tool for classification-based compositional processes. Pierre Schaeffer’s summary table of sound typology, the TARTYP, is a milestone in the evolution of contemporary approaches to the organization of musical material. In this paper, we propose a compositional method that combines the TARTYP classification of sound objects with generative grammars derived from this table. These grammars enable the creation of musical structures that reflect the inter-relationships suggested by the table’s structure. The tools presented in this paper are designed for real-time compositions in interactive environments. 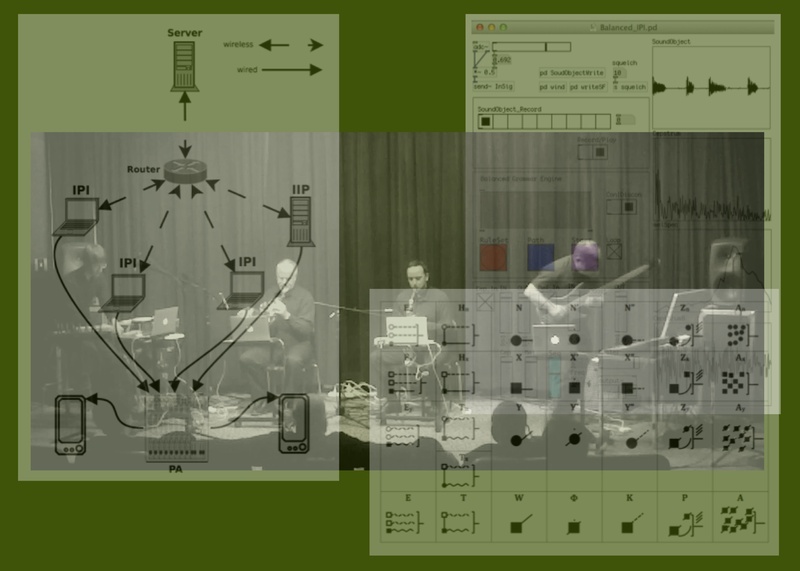 They are embedded in Max/MSP or Pure Data as extensions of the MaxObject class and directly engage the sound processing capabilities of these environments. The complex musical structures generated by these tools are brought to life at the surface of the composition in a versatile way that uses the spectral signatures of sound objects from Schaeffer’s sound examples. Motion is a time-based event situated in three-dimensional space. In the performance of most musical instruments, the musician associates physical motion with audible results. In some instruments, physical motion is used to change the timbre of the instrument. Digital techniques of analysis and re-synthesis have paved the way for the understanding of timbre as a distribution of energy among spectral frequencies in a three-dimensional space bounded by axes representing time, frequency and amplitude. This musical performance system explores the correlation between motion and sound, more specifically, timbre. A mobile device and its motion sensors function as a control element in the performance system that creates new timbres in real time. An interactive tool for real-time generation of Klumpenhouwer networks (K-networks) aiming to provide composers with flexibility in defining underlying musical structures. Henry Klumpenhouwer and David Lewin introduced the K-networks in 1990 (Lewin 1994) to describe the pitch organization of post-tonal compositions based on transformational relationships. Although K-networks are traditionally an analytical tool used to identify structural pitch-class relationships in a composition, in this software development I have applied a generative approach to this method for incorporating such networks as structural elements in real-time composition. Interactive compositional tools based on generative grammars derived from Pierre Schaeffer’s Tableau Re ́capitulatif de la Typologie (TARTYP, “Summary Table of Typology [of sound objects],” cf. Schaeffer 1966). These grammars enable the creation of new hierarchical musical structures that are, in turn, derived from the hierarchical structure of Schaeffer’s table. 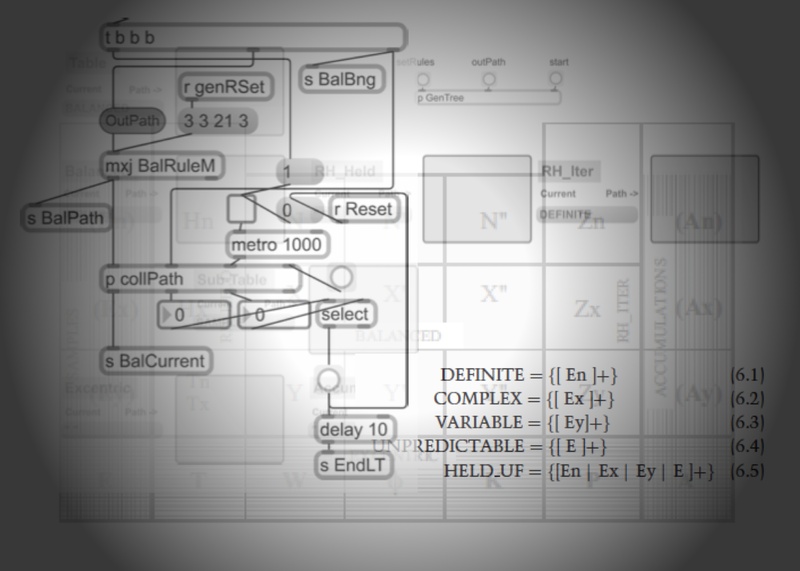 The tools are embedded in Max/MSP or Pure Data as extensions of the MaxObject class and directly engage the sound processing capabilities of these environments. A grammar object creates (in real time) a set of rules in one of the grammars and then constructs (in real time) multiple paths from the same set of rules. 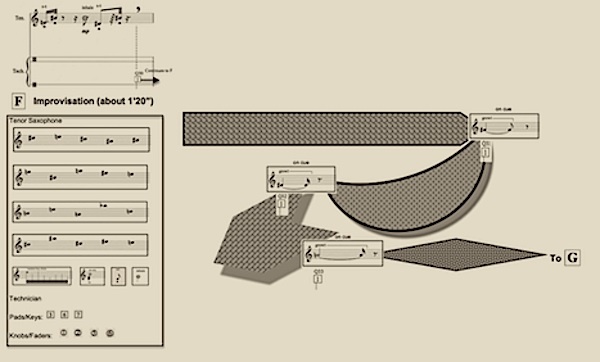 A performance system supporting Scheafferian sound-object improvisation developed for SIG~, a Schaefferian improvisation group based in Iowa City, Iowa. 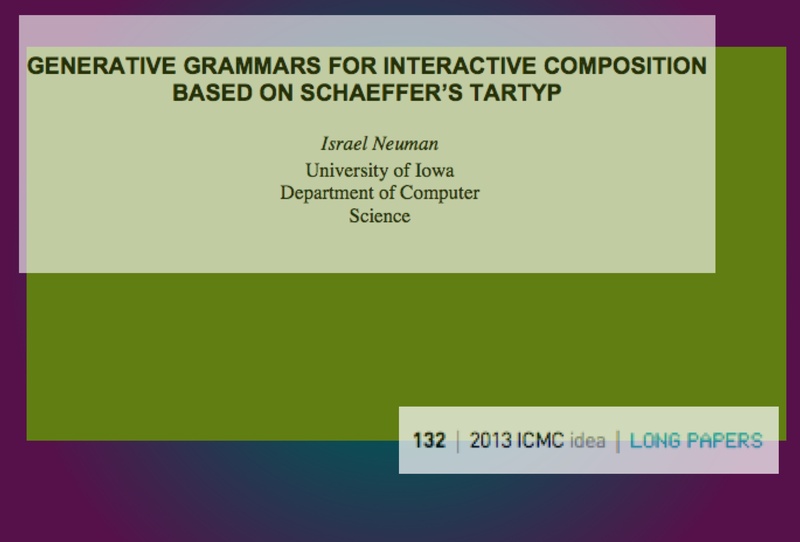 SIG~ was founded by Israel Neuman for the purpose of exploring the practical applications of Schaeffer’s TARTYP to real-time composition and computer improvisation. The system includes spectral filtering, network communication and animated scores. © Israel Neuman 2014 All right reserved.